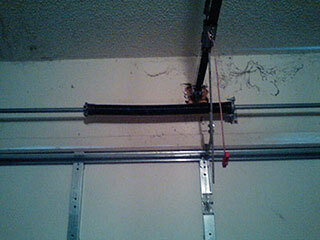 The springs that your garage door uses to support its weight are designed to last. They only have a limited lifespan, however, and will eventually need to be replaced. When they need to be swapped out, it’s essential to have our expert technicians help you, as these units can be extremely dangerous and should never be handled by inexperienced persons. We’ll ensure that your door is quickly put back into working order, with minimum disruption to your daily routine. When your door springs fail, they need to be replaced as soon as possible. These systems can’t be opened or closed safely without these components, so a quick response is very important. Don’t be tempted to try and replace these units yourself, however; they can be extremely dangerous if not handled by trained professionals. Let our team handle this task instead. We'll carefully detach the damaged units and install new sturdier ones in their place. Then we'll make sure their tension is properly adjusted and that your door can once again open and close without any issues. Why Would I Need New Springs? Garage door springs can last anywhere from between 3,000 to 10,000 cycles, depending on their quality and how well they are looked after. Considering that a single cycle represents a single time the door is opened and closed, and bearing in mind that a busy family might use their door more than a thousand times per year, it’s easy to see why these springs can wear out sooner than you’d imagine. As they accumulate more wear and tear, their tension will loosen, and their stability and flexibility will degrade. Eventually, they'll break, and when that happens, they could seriously injure anyone who happens to be standing nearby. If your door is wobbling or sagging when it moves, or if you notice that it's become unbalanced, it may be time to replace the springs. Our team will help you assess the situation, and install new units if that's called for. In addition to this, we also provide a full range of spring maintenance services, which include applying lubrication and adjusting tension on a regular basis. This helps to ensure these units reach their maximum service life. Whether you need emergency spring replacement, or you want to make these components last for as long as they can, our team is always ready to help. Contact Garage Door Repair Fleming Island today to arrange an appointment. As an experienced garage door repair service team, we specialize in repairing springs, tracks, and openers. From installing new extension springs to replacing rollers or even fitting a brand new door, we are on hand to tackle any job. Customer satisfaction is also our number one priority. Browse our site to find out more. Thank you for choosing our company! Feel free to browse our website for more information in the meantime. Our team at Garage Door Repair Fleming Island is at your service any time!